This article is about Anne Jackson. For other people with the same name, see Anne Jackson (disambiguation). Anna Jane Jackson (September 3, 1925 – April 12, 2016) was an American actress of stage, screen, and television. She was the wife of actor Eli Wallach, with whom she often co-starred. In 1956, she was nominated for the Tony Award for Best Featured Actress in a Play for her performance in Paddy Chayefsky's Middle of the Night. In 1963, she won an Obie Award for Best Actress for her performance in two Off-Broadway plays, The Typists and The Tiger. Jackson was born in Millvale, Pennsylvania in 1925, the daughter of Stella Germaine (née Murray) and John Ivan Jackson, a barber who ran a beauty parlor. She was the youngest of three children, after Catherine, eight years older, and Beatrice, three years older. Her year of birth had been misreported for years as 1926, the year Jackson gave in a 1962 interview. Jackson's mother was of Irish Catholic descent and her father, whose original name was Ivan Jchekovitch, had emigrated from Croatia in 1918. Her family moved to Brooklyn, New York when she was eight years old. She attended Franklin K. Lane High School. In New York, Jackson trained at the Neighborhood Playhouse and The Actor's Studio. She made her Broadway debut in 1945. Her theater credits included Summer and Smoke, Arms and the Man, Luv, The Waltz of the Toreadors, Mr. Peters' Connections and Lost in Yonkers. Jackson's screen credits include The Tiger Makes Out, The Secret Life of an American Wife, How to Save a Marriage and Ruin Your Life, Lovers and Other Strangers, Dirty Dingus Magee, Folks!, and The Shining. Her many television appearances include Armstrong Circle Theatre, Academy Theatre, The Philco Television Playhouse, Studio One, The Untouchables, The Defenders, Gunsmoke, Marcus Welby, M.D., Rhoda, The Facts of Life , Highway to Heaven, Law & Order, and ER. She narrated Stellaluna on an episode of the PBS series Reading Rainbow. In March 2017, the Harry Ransom Center announced the acquisition of Anne Jackson's archive along with her husband's. It will be made available to the public when cataloging is complete. Jackson was married to actor Eli Wallach, with whom she acted frequently, from March 5, 1948, until his death on June 24, 2014. They had three children, Peter, Katherine, and Roberta. Her marriage to Wallach was one of the longest and most successful in the industry. She later taught at the HB Studio in Manhattan, and continued to act in cameo roles. Jackson died at her home in Manhattan on April 12, 2016, aged 90. ^ a b c d e f McFadden, Robert D. (April 13, 2016). 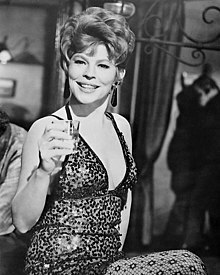 "Anne Jackson, Stage Star With Her Husband, Eli Wallach, Dies at 90". The New York Times. Archived from the original on April 16, 2016. Retrieved April 13, 2016. Note: Some sources, including FilmReference.com, give middle name as June. ^ Bernstein, Adam (April 14, 2016). "Anne Jackson, theater stalwart who teamed onstage with husband Eli Wallach, dies at 90". The Washington Post. Archived from the original on April 17, 2016. Retrieved April 17, 2016. ^ a b Anne Jackson at the Internet Broadway Database; retrieved April 16, 2016. Archived from the original on April 16, 2016. ^ United States Census records list "Anna Jackson" as 4 years old in 1930 Census, enumerated on April 19, 1930, and 14 years old in 1940 Census, enumerated on April 6, 1940, putting her birth date between April 1925 and April 1926. ^ Anne Jackson at the Internet Off-Broadway Database; retrieved June 11, 2017. ^ a b Jackson, Anne, in Tallmer, Jerry (October 2006). "Anne Jackson and Eli Wallach: Act II". Thrive NYC. 1 (17). Community Media, LLC. Archived from the original on October 11, 2010. I was in school, Franklin K. Lane High School. I was born in Millvale, Pennsylvania [just outside Pittsburgh], and the family moved to Brooklyn when I was 8. ^ "Papers of Actors Eli Wallach and Anne Jackson Acquired". www.hrc.utexas.edu. Retrieved 2017-03-06.